February is the quintessential Carnival month, celebrated with parades, street decorations, masquerade balls, fireworks and general merriment. Carnival, Carnevale in Italian, has origins in the ancient pagan Greek Dionysian and Roman Saturnalia holiday partying. Expect several weeks of unrestrained enjoyment of food, drink and sensual pleasures leading up to Martedì Grasso, or Fat Tuesday, which this year falls on February 13. This is immediately followed by 40 days of Lent, a time when good Catholics fast or deprive themselves of something they enjoy. Wherever one is in Tuscany this Carnival season, there is sure to be an event nearby filled with fun and frivolity. While the region’s biggest Carnival in Viareggio, there are many others of note. For the visitor, a glimpse of homegrown customs and local cuisine provides a unique experience. Be sure to try cenci, a Carnival delicacy, decadent strips of deep-fried pastry dough dusted with powdered sugar. Feb. 4, 11 (3 pm), 13, 17 (5 pm): VIAREGGIO CARNIVAL. Viale Mazzini. Admission €20 (€35 euro on the 17th), children 7 – 14: €15 euro (€25 euro on the 17th), under 7 free. Tickets are available at ilcarnevale.com, as well as an interactive application for iOS and Android that provides GPS navigation and personalized schedules for the festival. In its 145th year, the Viareggio Carnival brightens the northern coast of Tuscany with food, music, culture, and tradition. Highlighting Carnival are parades of allegorical, elaborately designed papier-mâché floats that travel through a 2-kilometer (1.2 mile) course. The floats attract spectators of all ages and walks of life, as they satirize pressing issues including Italian and global politics. Spanning four categories and ranging in size, float themes include “La Pace di Cristallo” (Crystal Peace) by Fabrizio Galli, depicting the current fragility of our world’s state of peace surrounding nuclear warfare and the arms race. Caricatures of world leaders such as Trump, Putin, Jinping, and Jong-un sit atop a chained dove and hold missiles in their hands. “La Mafia Non Esiste” (The Mafia Doesn’t Exist) by Edoardo Ceragioli, recalls the murder of anti-mafia, political activist Peppino Impastato, and depicts the underbelly of the Mafia’s involvement in Italian politics. On a lighter note, “Satisfaction” by Luca Bertozzi pays homage to the Rolling Stones and celebrates the 50th anniversary of the anthem that catapulted the late ‘60s anti-establishment movement, while simultaneously voicing the personal dissatisfaction evident in today’s youth. “What about Earth?” by Roberto De Leo and Vania Fornaciari confronts a dying planet Earth and asks spectators to become more aware of the inadequate political decisions being made regarding this issue. This seaside town in southern Tuscany hosts four parades (February 4, 11, 18 and 25 at 2:30 pm. Admission €5). At 2:30 the parade assembles on Lungomare Carducci, the avenue along the sea, and winds its way through the town, accompanied by marching bands, Vespas and costumed revelers. The eight neighborhoods of Follonica compete for prizes for the most creative masks and floats. A coastal city most known as the ferry port for the Island of Elba, Piombino hosts a Carnival festival with a Bacchanalian character known as “Il Cicciolo,” the King of Wine. The main attraction, a jolly, drunken float lurches its way down the parade course. Alas, the fun has to end sometime, and Il Cicciolo is burnt at the stake on Martedi Grasso (Fat Tuesday) for excessive partying. The flames signify the beginning of Lent and more sober times. Parades (admission €2.50) will be held in Piazza della Costituzione on February 4, 11 and 13 at 2:30 pm; the bonfire on February 13. South of Arezzo, Foiano della Chiana boasts one of Italy’s oldest Carnival celebrations, originating in the Middle Ages. Four rival neighborhoods work all year on their floats that are judged by a jury composed of a painter, a sculptor, a journalist, a theatre set designer and an art critic. The float with the most votes wins the prized Carnival Cup. The principal character of the festival, Giocondo, King of the Carnival, a figure dressed in rags, is sent up in flames in a bonfire on the last day. Stuffed with firecrackers, the burning effigy creates a spectacular show and symbolizes a form of collective purification for the town’s residents. The main attractions are the parades, every Sunday in February beginning at noon when the enormous floats move slowly down Corso Vittorio Emanuele, and costumed revelers fill the streets. 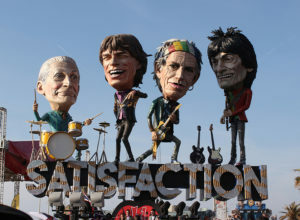 The floats, with political and allegorical themes, often make jest of popular culture icons and world leaders. In times past riders on the floats threw lupines, chestnuts and pieces of salt cod at the spectators below, but today candy and confetti fall at the feet of the waiting crowds. Every Sunday at noon and 6 pm brings Carnevalandia, a free children’s extravaganza offering balloons, theatre shows, clowns, jugglers, games and treats. Parades will be held on February 4, 11, 18 and 25 at noon. There is free parking at Valdichiana Outlet Village with free shuttle service to parade grounds; admission is €9 with family rates. The Carnival processions of floats and dancers in Borgo San Lorenzo, in the Mugello valley north of Florence, has roots dating back to the time of the Medici rulers. The piazzas and alleys of the town will come alive with over 400 masked participants, dragons on stilts, music and shops with animated window displays. Especially of interest to children is the colorful train offering rides. The action, with parades on February 4, 11 and 13 at 2:30 pm centered in tree-lined Piazza Dante, begins at noon; access is free. This iconic medieval village with its soaring towers is the setting for a folkloristic Carnival revel on February 4, 11, 18 and 25 at 3:30 pm with free admission for all. Vibrant floats accompanied by live music wind their way through the narrow streets of the town. Street food is abundant, and visitors will want to celebrate with locals.